The highly accurate and dependable RL-18C on-the-car brake lathe with power drive unit provides a consistently superior on-the-car rotor finish by combining accuracy and speed features that work together to help tackle today’s complex rotor finishing challenges. The unmatched precision and accuracy of the RL-18C increases productivity by reducing floor-to-floor times and minimizing comebacks. Our exclusive variable speed power-drive turns spindles at a fast or slow speeds for better finish cuts and specially designed adapters assure that rotors are machined to exact manufacturer's specifications. Our patented quick-yoke and coupling device attaches to a single lug bolt and automatically centers itself to the power drive shaft. The RL-18C lathe attaches directly to the brake caliper bracket, insuring fast easy machining with no need for timely run-out compensation procedures. Below you will find much more information about this product, all of the INCLUDED features that set this product above the rest can be found: Details on the Imaging Unit, Computer, & all other Featured Components; a full list of Specifications; a Photo Gallery with more pictures of this product; See Below For More Info! Simple Ergonomic Design - The Ranger RL-18C is easy to operate and durable enough to withstand every day abuse, especially in a busy shop environment. Our sensible ergonomic design means easier operation helping take the guesswork out of critical rotor finishing operations. Variable speed control, rotation control switch and emergency stop button is conveniently located right at your fingertips. Quick Set-Up - Our patented quick-yoke and coupling device attaches to a single lug bolt and automatically centers itself to the power drive shaft. The RL-18C lathe attaches directly to the brake caliper bracket, insuring fast easy machining with no need for timely run-out compensation procedures. Complete Accessory Package - We make it easy by providing all the accessories you will need to finish-cut virtually all rotor types and sizes both import and domestic. Our standard accessory package includes RL-18C On-Car Brake Lathe with power-feed auxiliary drive unit, twin micrometer-type tool holders with 6-sided carbide inserts, complete set of mounting plates and shims and adapters for general purpose, an illustrated instruction manual and video along with a high impact toolbox and carrying case. The choice is yours. Use the cars engine to turn the rotor or use the patented Power-Drive assembly. Lathe unit attaches easily to the caliper mounts ensuring the rotor is always square to the caliper, producing an accurate machined surface that exceeds OEM specifications. Electric servo-drive eliminates troublesome belt drives. Universal Slide Mount - Makes set-ups and centering of tool holders fast and easy. Allows you to cut with either positive or negative rake. Simultaneously machines both sides of the rotor parallel eliminating run-out problems. Rigid mounting micrometer type tool holders eliminate flexing for maximum accuracy. Specially designed adapters assure that rotors are machined to exceed manufacturer's specifications. Simple, user-friendly controls. Variable speed control on power-drive turns spindle at fast or slow speeds for better finish cuts. Emergency stop switch for both lathe and drive unit motors. Clockwise and counterclockwise switch turns rotors for either right or left side. Automatic Stop Feature - Shuts the unit off when the finish cut is complete. After the finish cut is complete and the unit shuts off an audible alarm “beeps” and lets you know the job is done. 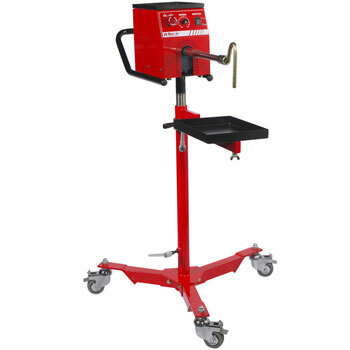 Patented single-lug quick-yoke - attaches effortlessly and automatically centers itself. 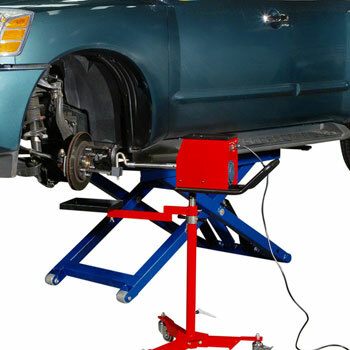 Heavy-duty, fully adjustable power-drive stand. Heavy-duty locking caster allows for fast and stable positioning of power drive assembly. High-impact plastic storage case for tools and accessories.